The interior has been completely redone with new furnishings that give a comfortable, rustic vibe. It feels like an American farm restaurant. We were invited to a preview dinner and to provide criticism of the menu the night before opening. There was not much to comment on as everything was so good! Presentation was excellent as well as the dishes having lots of flavor. Let's take a look at a few favorites. 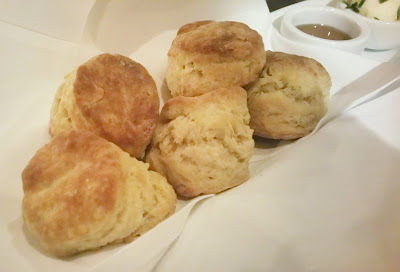 I'm really picky about biscuits. After all, they are hard to do really well. No problem here. These small biscuits are an appetizer served with butter and honey. As the server took the plate and I grabbed the last one, he asked if I wanted the butter and honey. No. If you can't eat a biscuit on its own, it's not good enough. 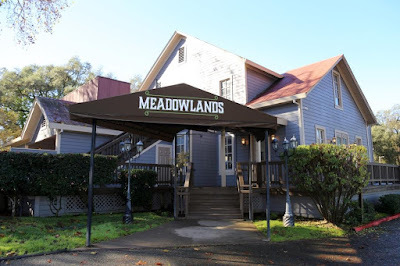 Meadowlands' biscuits are soft, flakey, and have enough salt to make them tasty solo. 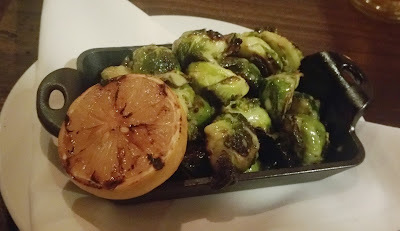 We also loved the Brussels sprouts appetizer. Nice and sticky with a maple jalapeno reduction, I loved them on their own, but the server insisted we not forget to squeeze the lemon on top to cut some of the bitterness. Good either way. 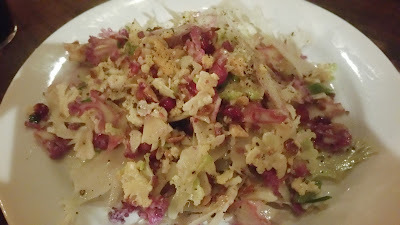 LOVED this Shaved Cauliflower Salad with apple, fennel, pomegranate seeds, and a ginger vinaigrette. I described it as "bright and energetic" because it woke me up with bright flavor. 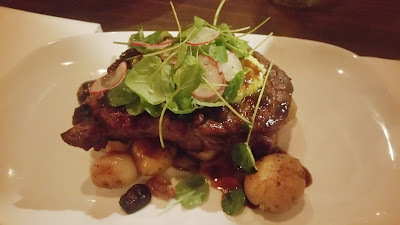 I ordered the Lucky Dog Ribeye because I love their beef and I was in the mood for a ribeye. The thing with ribeyes in fine dining restaurants these days is that they are often over $30, which is beyond my price point. This one is priced at $28 and I love that. It was served with roasted potatoes and pearl onions and had a lovely herb butter on top. It was everything I want a ribeye to be. This dish might be renamed as we said that Beef in a Barrel made us picture more of a braised short rib style dish. In actuality the barrel refers to the barrel smoker. The beef was served with a delicious chimichurri. 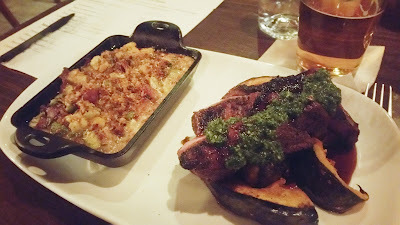 The more notable dish is the mac n cheese on the left. Instead of using pasta, they use small cubes of cauliflower florets. It's a great, winning take on mac n cheese. These were the dishes that most impressed me out of the ones we tried. You will also find grilled trout from nearby Passmore Ranch. Michael Passmore, meanwhile, has been raving on the roast chicken, which I plan to try in the future. We did not get to try any desserts that night, so I look forward to those as well. 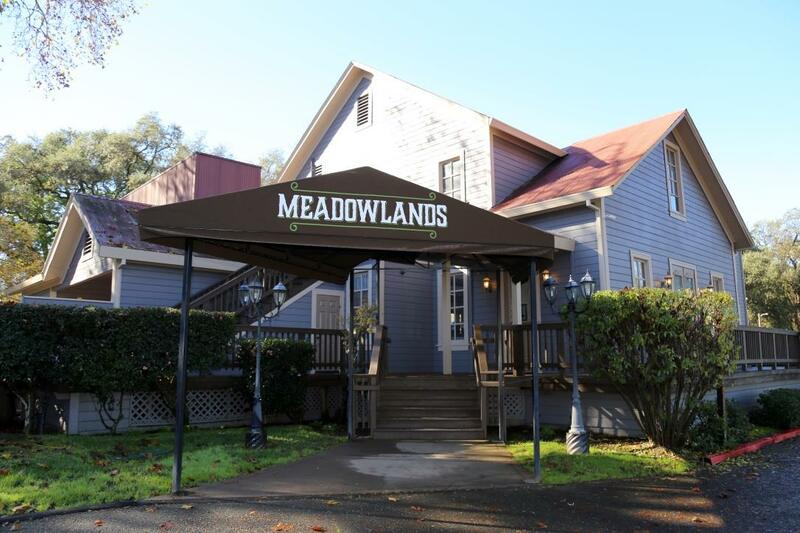 I know the locals are excited by Meadowlands' arrival. For those in Sacramento, it's a worthy stop along Jackson Highway.